Much of Canada and Alaska is covered by Boreal Forest. The Focal Geography area lies just south of the Sub-Arctic, between the southeastern edge of Hudson Bay on its western end and continues east to the coast of Labrador. The southern border includes those lands just above the Great Lakes, and sits above the Atlantic Canada and Northeastern Focal Geography to the east. 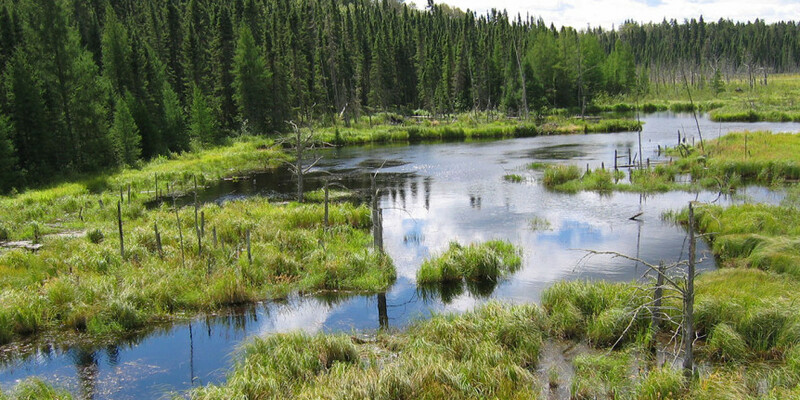 The Boreal Forest is dominated by spruce and other conifers frequently growing in very dense stands. The shorebirds that rely on this ecozone use a variety of open habitats, primarily wetland openings within the forest, such as bogs, shallow ponds, and the marshlands associated with river plains. As the forest thins to the north, more tundra-like conditions persist, creating a mosaic of thin forests and expansive openings, providing nesting and stopover habitat for additional species. Many Arctic-nesting species use specific locations within this ecozone for staging during both northbound and southbound migrations. The most significant of these staging sites is the southern coast of James Bay, supporting millions of shorebirds annually. The Focal Shorebirds associated with the Boreal Focal Geography for nesting include the: Greater and Lesser Yellowlegs, Marbled Godwit, Semipalmated Sandpiper, and on its northern open edge, Whimbrel. The primary threats to shorebirds in the Boreal Focal Geography involve large-scale energy production and mining. The activities of greatest potential negative influence include hydropower, mining, and petroleum extraction. Direct mortality from hunting within this focal geography occurs, particularly along the eastern coastal edge of this area in Quebec, but the extent or significance of this hunting is yet to be fully understood.